A French activist who was arrested on Friday during a demonstration in the West Bank against Israel’s decision to demolish Khan al-Ahmar village began a hunger strike Saturday. Frank Romano, who is being held at an Israeli police center, launched the hunger strike demanding that Israel’s Supreme Court revoke its decision to approve the planned demolition of the Bedouin village of Khan al-Ahmar, east of Occupied Jerusalem. 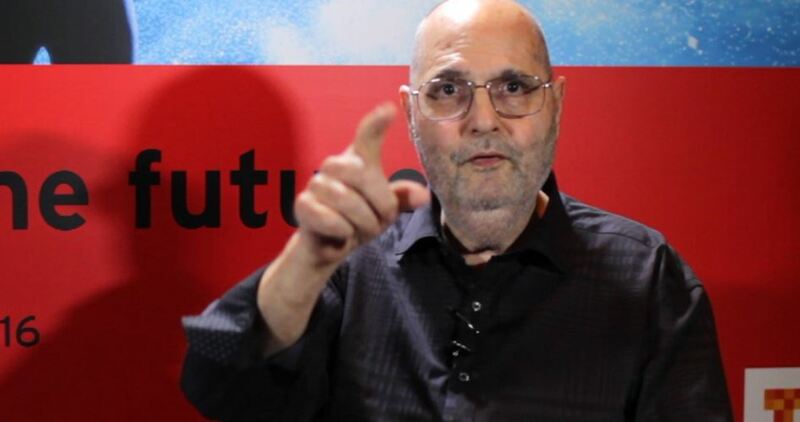 Coordinator of Save Khan al-Ahmar campaign Abdullah Abu Rahma said in press statements that Romano, a professor of law at Sorbonne University, came to Palestine to support people in Khan al-Ahmar. Israeli police on Friday arrested three Palestinians along with Romano during a protest against the demolition. Israeli police on Thursday demolished camps installed by Palestinian activists near Khan al-Ahmar as a protest step against Israel’s plan to forcibly transfer the people of Khan al-Ahmar and demolish their homes. Israel’s Supreme Court last week rejected a petition filed by Khan al-Ahmar residents against the demolition order, while the people of the Bedouin village rejected an Israeli offer to be transferred to an area lacking basic services near Jericho as an alternative home. Khan al-Ahmar is one of 46 villages threatened with demolition in favor of a settlement project called E1. The project is aimed at creating a physical link between Ma’ale Adumim settlement and Jerusalem, and that would effectively complete a crescent of Israeli settlements around East Jerusalem dividing it from the rest of the West Bank. Israeli tanks on Friday evening fired artillery shells at an UNRWA school east of Abasan town in the southern Gaza Strip. Local sources said that school was cancelled for Saturday after Israeli tanks attacked Abu Tuaima school causing partial damages in some rooms. 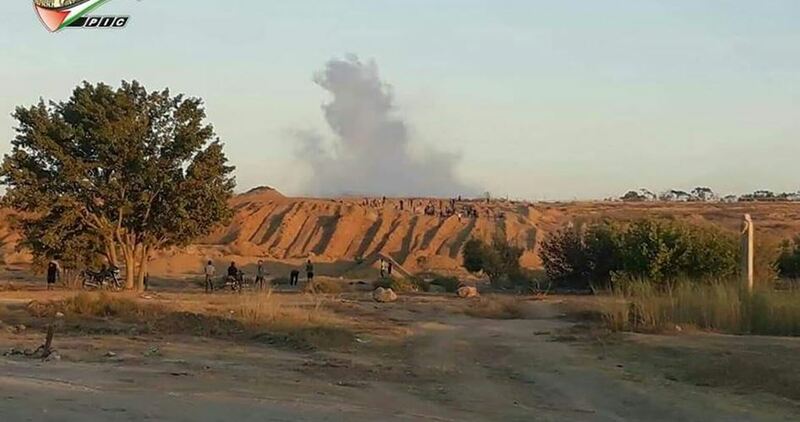 Israeli occupation army announced that two Hamas posts were bombed on Friday after grenades were thrown at its forces near the border fence. The army claimed that an Israeli officer was slightly wounded by shrapnel from an explosive device thrown by Palestinians. Three Palestinians were killed by Israeli gunfire during the Great March of Return protests on Friday, according to Gaza Ministry of Health. The martyrs were identified as Mohammed Shaqoura, 21, Shadi Abdulal, 12, and Hani Afana, 21. The Ministry said that 80 Palestinians were injured by live ammunition, including 18 children. My friend Abdulwahab (Abed) Sabbah is the director of Dar Assadaqa, a community center in Abu Dis, East Jerusalem. He is the Palestinian half of London’s human rights organization CADFA, the Camden Abu Dis Friendship Association. He sent me an account of an IDF attack on his family in their apartment in Abu Dis on September 4, and followups. What a day. We started early, at around 2:30 AM, when savage mercenaries from the Israel IDF invaded my father’s and my house. They started to knock hard on the main door, and when my father open the door, eight of them entered with their weapons into the house before I woke up and went down to see what was happening. By that time, five of them went up to my house [apartment], woke my family and pushed them downstairs to my father’s. All of us were held in one room; and the soldiers started to go into the rooms, one by one. They took our mobiles [cell phones] and IDs [and] birth certificates. My little daughters were sitting staring, not knowing what is happening. Who are these people with guns and masks wandering in our house, and shouting and pushing? My father was as usual the strongest and fought back. First, they wanted to arrest my son Mohammed. They took him up stairs without allowing me to go with him, and when he was ready they asked about my youngest son Yassar, who was out helping to prepare our cousin’s wedding, which is today. By the end they gave me a military order: to come to the Israeli military camp in Abu Dis at 10 AM. Four other young people, together with the wife of a “wanted man” (as they said), were arrested. And 10 houses at least were invaded at the same time in Abu Dis today. None of my five kids were able to to go to school today. My poor mother and father did not manage to sleep worrying about my sons and me. As for me, I went to the military camp at ten, as they wanted. They take my ID and hold me until three thirty PM. No one spoke to me; just waiting. Then they gave me my ID and asked me to leave. Today the army came back to Abu Dis boys school. I was there also, and again more teargas. It became my daily meal. I am going back to what I used to do last year: to go early near the schools to try and save the school day and help kids reaching the school safely because the army returns early and makes a checkpoint next to the schools. I asked him for his view of the reason for the IDF’s attacks. I don’t know if you can explain about the place, the East Jerusalem area, and its complete isolation by the wall, settlements, and checkpoints controlled by Israeli military camps, as it is all considered as areas B and C [of the occupied territories, in which Israel has complete control]. Among the past 30 years hundreds of young people, including children under the age of 16, were arrested by the Israeli army, and sent to prison for months if not years for joining demonstrations against the occupation or throwing stones. These young people will be arrested from their schools or in the middle of the night from their house, and will be sent to Israeli settlements around the area for interrogation, where they will be tutored and made to signs on statements written in Hebrew language, which they can’t read. Then they use [the ‘confessions’] in the military courts, where the young ones will be given sentences, including making their family pay thousands of shekels to release their children. Our children are facing this situationfor years, together with having to be all the time targets for the Israeli soldiers, on the streets, and inside their schools. Many, including my own son, was shot by [rubber bullets]. When he was 13 one of the [bullets] hit him in his face. In the night they came to the town, they entered 10 houses and arrested 5 people and one woman, and searched their house, destroyed their furnitures, and in the end they released the women and two men without any charges. Next morning we saw a film published by the Israeli army, talking about finding guns and weapons in Abu Dis — just to say to their people that they are doing their job. For me, I [have often been] a prisoner. I was arrested by the Israeli army 7 times– which none of them I was charged. It was all administrative detention, which is imprisonment without a trial. The first time I was 16. So now my sons are facing the same punishment, maybe because I am working for a human rights organization calling for justice for Palestine. My sons and family are targeted. All I want is to protect my family and my people from this wild daily harassment which is getting harder and harder. The life that we are living is not at all acceptable. Generation after generation have to face this terror and live in fear. It’s about time to break this inhuman situation and have free equal life for Palestinians. I asked Abed about the risk that publishing this account might put his family at even higher risk. My family should be prepared for that. We are living inside it. Let the world know who are these people and stop finding excuses for their crimes. Punitive measures taken against the Palestinians by the Trump Administration, including the cutting of UN aid and the closure of the Palestinian consulate in Washington, has not hampered peace efforts, the US president’s senior advisor and son-in-law Jared Kushner has said. Speaking to the New York Times on the 25 anniversary of the Oslo Accords, Kushner argued that the US had taken brave stances against Palestinian demands. Since the election of President Donald Trump, US aid to Palestinian refugee agency UNRWA has been effectively wiped out, submerging the UN branch into its worst financial crisis. Last week, Washington further slashed $200 million of allocated aid to the Palestinian Authority, as well as $25 million meant to support six hospitals in East Jerusalem. Kushner posited that the Palestinian leadership deserved the aid cuts for their reaction to the US’ decision to recognise Jerusalem as the capital of Israel and moving the US embassy to the city from Tel Aviv. “No one is entitled to America’s foreign aid,” he said, adding that the funds that went to UNRWA and other causes were being misused. On Monday, the State Department said it was closing the Palestinian Liberation Organisation(PLO) mission in Washington. The department said “the PLO has not taken steps to advance the start of direct and meaningful negotiations with Israel,” and pointed to Palestinian calls for the International Criminal Court (ICC) to investigate Israel as reasons for its decision. Despite reports that the moves have pushed the PA to consider cutting its last ties with the US government, including security cooperation, Kushner said that Palestinian anger did not negate the chances of a peace deal with Israel. The US has been working on the second edition of its proposed “deal of the century” since last summer, after its initial release was met with criticism. The proposal had ruled out the two-state solution as an answer to the crisis, instead giving Jordan and Egypt control of the West Bank and Gaza respectively. The plan was further undermined a week later when leaked footage revealed Kushner expressing doubt as to whether there was any solution to the conflict. The details have not been released, but preliminary reports indicate that the second peace deal will also not call for a two-state solution and will not urge a “fair and just solution” to the issue of Palestinian refugees looking to return, as previous proposals have done. Last month, it was revealed that Kushner has been pushing for the refugee status of thousands of Palestinians to be removed in an effort to halt the majority of UNRWA’s operations. Israeli media revealed on Friday an Israeli plan to reduce Gaza’s fishing zone as a “punitive measure” in retaliation for the seaborne protests aiming to break the 12-year Israeli siege imposed on the coastal enclave, Quds Press has reported. “In spite of Israel’s expansion of the fishing zone off the Gaza coast from six to nine [nautical] miles, Hamas has intensified breaking the siege flotillas so that friction with the Israeli navy has increased,” a security official told Israeli Channel 24 TV. Territorial waters are, by convention, set at 22 nautical miles, although fishing vessels are normally allowed to work in international waters. In any case, the Israeli navy often attacks Palestinian fishermen even within the very restrictive zone that the siege imposes. “We will continue seaborne demonstrations until we break the siege and end the suffering of the Palestinian people,” responded the National Committee for Breaking the Siege. “The Israeli occupation authorities impose strict restrictions on the work of the Palestinian fishermen off the Gaza coast.” A spokesman called on the whole world to stand against the Israeli measures. Meanwhile, the Israeli news website Walla reported Israeli military officials claiming that the sea demonstrations “provoke” the Israeli navy. “The [Israeli] army is afraid that Hamas will carry out attacks from the sea, using boats or divers,” it reported. During the past few months, Palestinians in the Gaza Strip have launched several seaborne protests aiming to attract international attention to the 12-year Israeli siege imposed on over 2 million people in the territory. 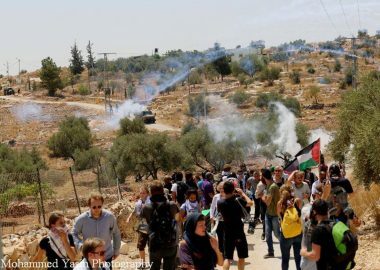 RAMALLAH, PALESTINOW.COM — A number of Palestinians chocked on teargas on Friday afternoon when the Israeli occupation forces (IOF) tried to quell a weekly protest in Ras Karkar village, west of Ramallah, against Israeli settlement projects in the area. Dozens of Palestinians, including Ras Karkar residents, Palestinians from neighboring villages, and foreign activists, took part in the protest. They performed Friday prayer on lands threatened with confiscation, then started to plant new olive trees in the village as a message that they will never give up their lands and that they reject all settlement projects targeting the village. A number of protesters suffered breathing difficulties after the IOF soldiers heavily fired rubber-coated metal bullets, sound bombs and teargas canisters at them. Twenty-five years after the Oslo Peace Accords, which brought an end to the Intifada of Rocks in Palestine, the Palestinians had a very big zero of their rights. On this day in 1993, Chairman of the Palestinian Liberation Organisation (PLO) Yasser Arafat and Israeli Prime Minister Yitzhak Rabin, shook hands after signing the Oslo peace accords, in what would become an iconic moment in the history of the Israeli-Palestinian conflict. Yet 25 years later, the promise of peace remains unfulfilled and the struggle for a Palestinian homeland continues, with the failure of Oslo increasingly acknowledged. The famous handshake marked the final stage of months of secret peace talks conducted in Oslo, Norway between the Israeli government and leading Palestinian faction Fatah. Under the terms of the deal, Israel agreed to withdraw its troops from Gaza Strip and the occupied West Bank by April 1994. Elections were to be held in the territories to allow the Palestinians some form of autonomy and self-governance. In return, Chairman Arafat signed two letters renouncing violence and officially recognising 78 per cent of historical Palestine as Israel; Tel Aviv, in turn, withdrew their recognition of the PLO as a terrorist organisation, instead affirming them as the legitimate representative of the Palestinian people. The issue of Jerusalem, settlements, Palestinian refugees, and the question of borders were among the responsibilities that would remain with Israel. The accords were also to preserve Israel’s exclusive control of the borders, the airspace and of Gaza’s waters. The peace deal was due to be signed in Washington under the ushers of the administration of the US President Bill Clinton. On 13 September 1993, Clinton introduced the two leaders, alongside other state officials and former US presidents Jimmy Carter and George Bush, to the crowd of invited guests in front of the White House. The two national heads did not sign the declaration themselves. Instead, Israeli Foreign Minister Shimon Peres and Palestinian counterpart Mahmoud Abbas did the signing to rapturous applause. The two statesmen then turned to face one another, with President Clinton’s arms outstretched between them, before Arafat extended his hand first towards Rabin. The handshake prompted a standing ovation and cheers from the audience. Arafat then proceeded to shake hands with Peres and the other Israeli officials on stage, a move not reciprocated by Rabin. In speeches delivered after the signing, Prime Minister Rabin then addressed the crowd of reporters and officials: “We who have fought against you the Palestinians, we say to you today in a loud and clear voice, enough of blood and tears, enough,” he proclaimed. The handshake made front page headlines across the world, hailed as a historic triumph of peace over conflict by media outlets and politicians. The signing of the Oslo Accords brought an end to the First Intifada, which had seen hundreds of Palestinians killed and thousands injured after Israel responded violently to the popular uprisings across the occupied territories. In 1994 Arafat and Rabin received a Nobel Peace Prize for their participation in the accords. Arafat was also elected president of the newly established Palestinian Authority (PA) the same year, which paved the way for the signing of Oslo II in 1995, which affirmed the establishment of a Palestinian interim self-government. Neither accord promised future Palestinian statehood. Twenty-five years on from the signing of the Oslo Accords, Israeli military withdrawal from the West Bank has never taken place. Israel has planted hundreds of military checkpoints, expanded illegal settlements that have seized large swathes of Palestinian farms and residential areas, built an illegal separation wall and evicted Palestinians from their homes and handed them to Israeli settlers. The parties and sponsors of Oslo agreed to implement interim self-governance arrangements and a framework to facilitate the negotiations for the final status issues by the end of 1999. However, two and a half decades later, no progress has been made. In 2015, Mahmoud Abbas told the UN General Assembly in New York that Palestine is still under occupation and that consequently the PA is no longer bound by the Oslo Accords signed with Israel. Since the election of US President Donald Trump, negotiations for the “deal of the century” have been underway, with the administration finalising a plan that will allegedly end the conflict. Preliminary reports indicate that the peace deal will not call for a two-state solution and will not urge a “fair and just solution” to the issue of Palestinian refugees looking to return, as previous proposals have done. Israeli occupation snipers killed on Friday three peaceful Palestinian protesters, including two children and wounded 286 others, including two female paramedics, Palestinian ministry of heath said. 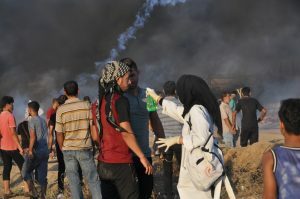 During the weekly protests along the eastern side of the Gaza Strip, the Israeli snipers targeted the peaceful Palestinian protesters with live ammunition and strange tear gas. The ministry of health identified the martyrs as Shady abdel-Al, 12, from the northern Gaza city of Jabalia, Mohammad Shaqqoura, 16, from Al-Burij Refugee Camp in the middle area of Gaza and Hani Afana, 31, from the southern Gaza city of Rafah. According to the ministry of health, 18 children were among the protesters who were wounded by the Israeli snipers and two female paramedics. In addition, the ministry said, there were six protesters who sustained serious wounds, including one in a very critical condition. He are images for a Palestinian youth after he had been shot by an Israeli sniper. It is clear he did not pose any danger on the sniper’s life. Israeli soldiers attacked, Friday, many nonviolent Palestinian, Israeli and international peace activists in Bil’in village, west of the central West Bank city of Ramallah, after the army attacked the weekly procession against the Annexation Wall and Colonies. The procession started from the center of the village, heading towards the Wall, near Abu Lemon area, before the soldiers started firing gas bombs, concussion grenades and rubber-coated steel bullets at them. Many Protesters suffered the effects of teargas inhalation, and received the needed treatment. The media coordinator of the Popular Committee against the Wall and Colonies in Bil’in, Abdullah Abu Rahma, said the procession this week was in solidarity with the al-Khan al-Ahmar Bedouin community, facing demolition and displacement. Abu Rahma added that the protest also comes in rejection to the so-called “Deal of the Century” plan of U.S. President Trump, and his hostile policies towards the Palestinians, their rights and their struggle for liberation and independence. 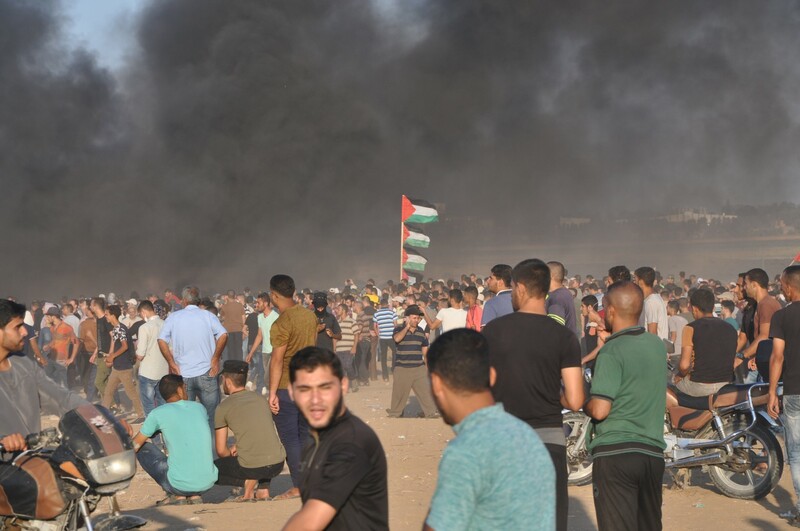 On Friday afternoon, 14 September 2018, using excessive force against the peaceful protesters in the eastern Gaza Strip for the 25th Friday in a row, Israeli forces Killed 3 Palestinian civilians, including a child, and wounded 148 others, including 19 children, 5 women and 5 paramedics with live bullets and direct tear gas canisters. Six of those wounded sustained serious wounds. At approximately 16:30, thousands of civilians, including women, children and entire families, started swarming to the 5 encampments established by the Supreme National Authority for the Great March of Return and Breaking Siege along the border fence, east of the Gaza Strip governorates. They raised flags and chanted national songs. Hundreds, including children and women, approached the border fence with Israel, set fire to tires and gathered 300 meters away from the main border fence. Some of them attempted to throw stones at the Israeli forces, pulled parts of the barbed-wire fence established inside the Palestinian territories and fired incendiary balloons along the border fence. Hani Ramzi ‘Afana (21), from Rafah, was hit with a live bullet to the chest in eastern Rafah. Mohamed Khalil Ghazi Shaqqourah (20), from al-Maghazi refugee camp, was hit with a live bullet to the chest in eastern al-Buriej camp. Shady ‘Abed al-‘Aziz ‘Abed al-‘Al (11), from Jabalia, sustained deep incised wound after being hit with a solid object, which caused a fracture to his skull, during his participation in Abu Safiyah area, northeast of Jabalia, according to the Ministry of Health. Moreover, 148 civilians, including 19 children, 5 women and 5 paramedics, were wounded with live bullets and direct tear gas canisters. Six of those wounded sustained serious wounds in addition dozens suffering tear gas inhalation and seizures after tear gas canisters were heavily fired by the Israeli soldiers from the military jeeps and riffles in the eastern Gaza Strip. PCHR emphasizes that continuously inflicting casualties, either killed or wounded, is unjustified, and using lethal force to target and kill civilians, who exercise their right to peaceful assembly or while carrying out their humanitarian duty, is a serious violation of the rules of international law, international humanitarian law, the ICC Rome Statute and Fourth Geneva Convention.